"I love roasting veggies and hit on this WONDERFUL combo. You could use a Hollandaise on the side.... but why??" 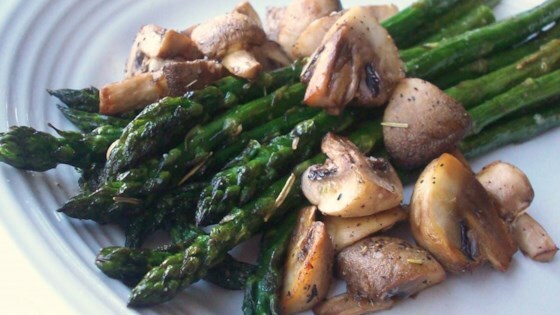 Place the asparagus and mushrooms in a bowl. Drizzle with the olive oil, then season with rosemary, salt, and pepper; toss well. Lay the asparagus and mushrooms out on the prepared pan in an even layer. Roast in the preheated oven until the asparagus is tender, about 15 minutes. What happens to the mushrooms? This recipe only suggests you roast the asparagus. Is there a typo or is she serious?